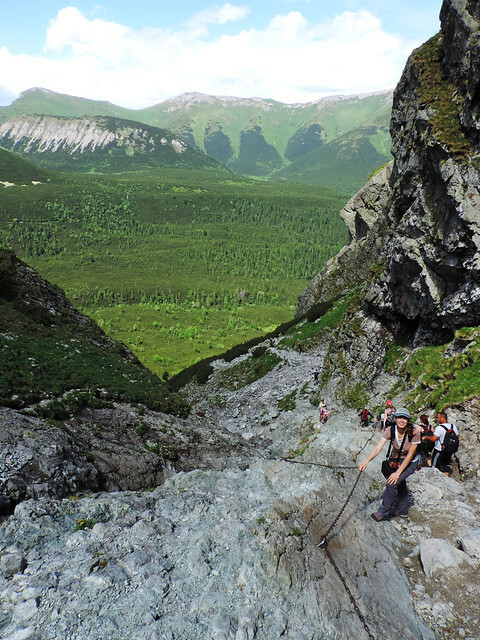 This unique gem of the Tatras can be accessed on several trails and of course, we chose the most strenuous one. But not because of our ego (not only because of that 😀 ). The real reason is that this long loop offers wonderful scenery all the way. Pretty lakes. A scenic route to Veľká Svišťovka pass. A challenging downhill section with breathtaking panorama all the way down to Green Lake. Last but not least an easy walk along a mountain creek in a charming valley to complete the loop. The trail starts from the village of Tatranská Lomnica. We parked our car in the huge parking lot at the base station of the gondola (no parking fee) and started looking for green signs on the trees as the first section of our hike was supposed to be on the green route up to the first lake, Skalnaté pleso (translated as Rocky Mountain Lake in English). We found no sign. Then we finally found a blue one. Not good, that is a different route. So we just headed in the same direction as the gondola going up to Skalnaté pleso. The path was obvious and later we noticed the green signs, too. Fortunately, it’s hard to get lost during this first section of the hike because the trail goes parallel with the gondola. Want an easy way up? By the way, you can also take the gondola up to Skalnaté pleso. With this trick you can skip a steep section of the hike – and you also skip all the beautiful wildflowers on the meadows. Yeah, we are those people who would never advice to take the gondola instead of hiking. If we hike, we hike. But that’s us. And even we admit that it comes handy if you are tight on time as the gondola saves you about 3 hours. Skalnaté pleso is right there at the end station of the gondola. It was a perfect picnic spot before we continued towards Veľká Svišťovka peak. But if you really don’t want to hike at all and still have even more amazing views… let us share another easy way to a thrilling panorama. There’s a cable car from Skalnaté pleso to Lomnický peak. This peak is actually only accessible by cable car, there’s no hiking trail up there. We didn’t try it as we wanted to finish our beautiful loop before sunset. 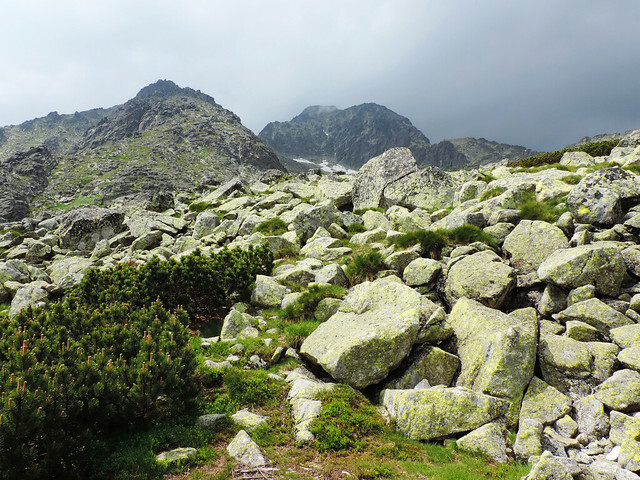 But it could only be wonderful as 2634 metres high Lomnický peak is one of the most visited mountain peaks in the Tatras. So as you see there’s beauties for the non-hikers, too, but even more for the hikers. 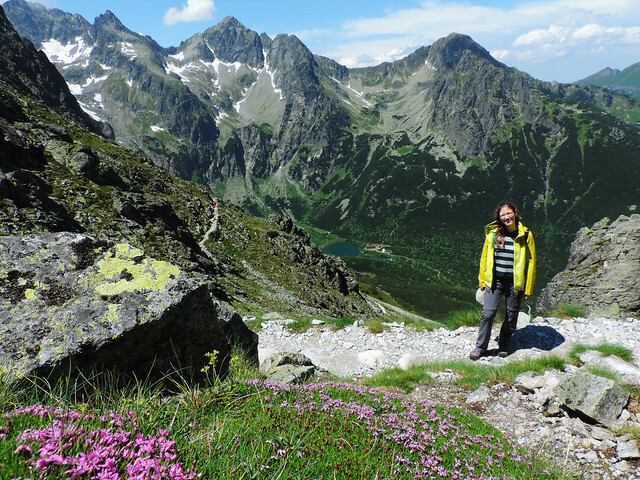 😉 Because there’s a scenic trail from Skalnaté pleso to Veľká Svišťovka pass. High peaks towered above us as we reached the pass to get our view of a beautiful valley and an incredibly green lake. That lake far below us was the highlight of our day. We enjoyed the steep downhill route from Veľká Svišťovka to Green Lake. It offered some challenges (some very steep sections secured by chains but they were fun!) and stunning views of the valley all the way. But the best view was Green Lake itself as the surrounding peaks reflected in the perfectly clear green water of this remote alpine lake. I mean, could you get enough of views like this? As you may already realized there’s a pretty great thing about this hike. I mean other than Green Lake itself. And it’s that you can choose the ideal length of the route yourself. 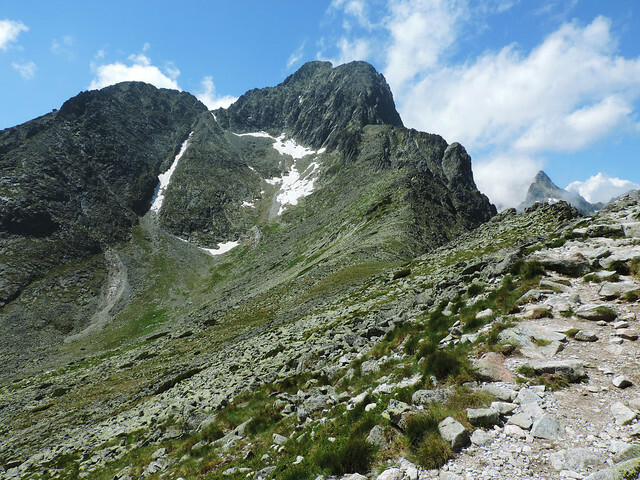 You can go up to Skalnaté pleso by gondola and then hike to Veľká Svišťovka pass. Or even further down to Green Lake. 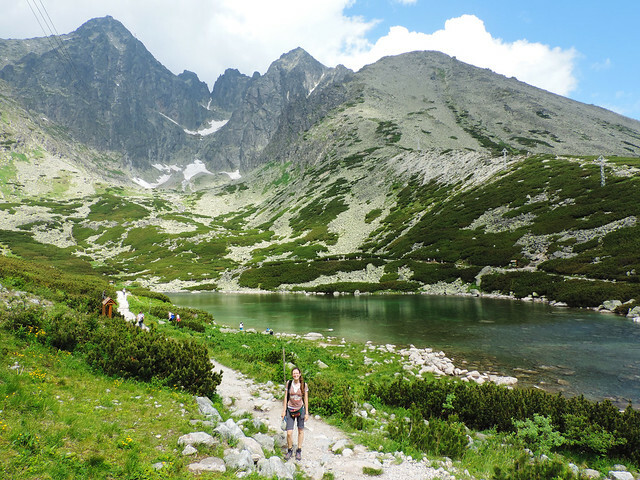 Or you can take the cable car to Lomnický peak, have a picnic at Saklnaté pleso and take the gondola back. You can hike as much as you want. Or not hike. Anyway, you will have some incredible views! High mountains, long winters. 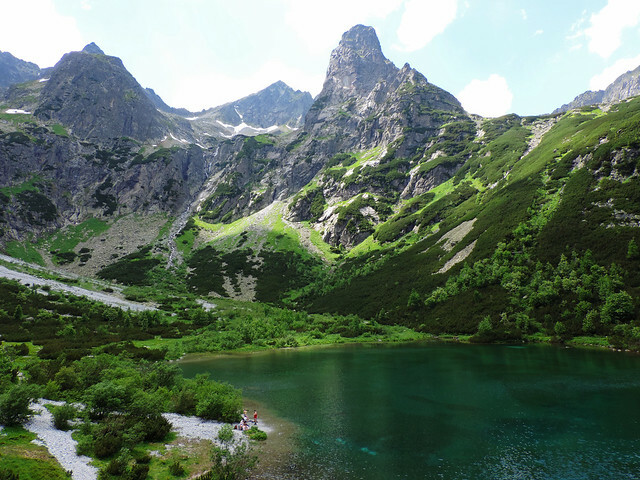 That’s the case in the High Tatras, too. Most of the trails are open from the middle of June until the end of October. 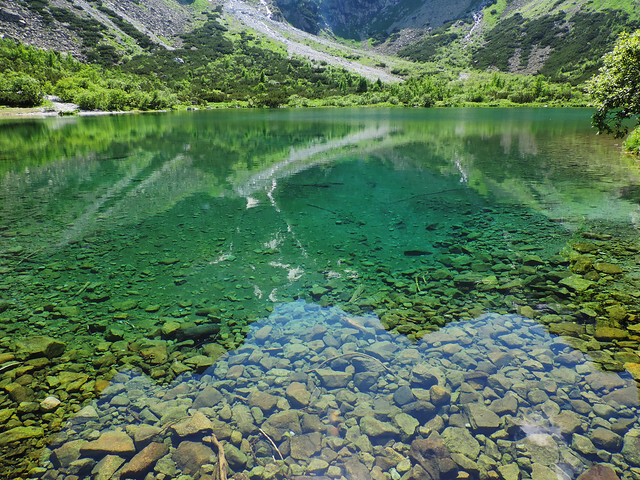 Just like the section between Skalnaté pleso and Zelené pleso (Green Lake). Weather is always very unpredictable though so you better have a raincoat even in the summer. The trailhead is in Tatranská Lomnica so you can’t go wrong with staying in this town. But there’s a bunch of other towns which are very close by car – like Stará Lesná, Nová Lesná, Tatranská Kotlina. Even the city of Poprad is only a 20 minutes drive. We usually choose the cheapest guest house or apartment what we can find in any of these towns. Or the one which still offers vacant places. Because July and August are very popular seasons.